Their gut strings are the only thing that I will use on my Staufer guitar (built ca. 1828 in Vienna). These are what I used on the CD of the Complete Sonatas of Diabelli, Op. 29. LaBella has been making strings since the 1600's and the firm is - without question - the most progressive in the business. Their designers are constantly trying new materials, composites, and they have developed the best and widest variety of sounds that you can get out of a string. As far as I'm concerned, no other strings exist! To top it off, they are some of the most friendly, open and honest people I have ever worked with. If you have an idea for a string design - they'll listen. Brilliant strings and exceptional people! 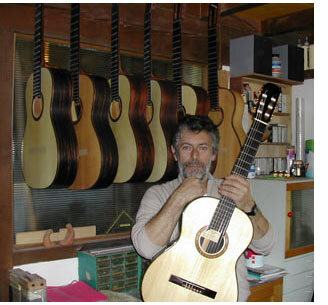 I met Gioachino and his wife Nadia rather by accident at the Salzburg Music Festival (Austria) in 1989, and after hearing one of his guitars, I immediately ordered one. I had been playing a "Church-Door" Rodriguez and a very fine Ramierez. After the first Giussani arrived I immediately sold the other guitars and ordered another Giussani - then another and after that, I simply decided to stay on the waiting list to have one made each year! I - and a growing number of professional guitarists - simply won't play anything else. I prefer his spruce-tops, and even if you're a hard-core cedar-top fan, I would suggest that you try one of his spruces. They have all the power of a cedar and Gioachino somehow manages to incorporate the mellowness that we associate with a cedar while maintaining the clarity of a spruce. He traditionally builds the sides and backs with Brazilian rosewood, but has recently begun experimenting with maple - logical if you remember that all the great violins have maple sides and backs! I played one of these last year and have ordered one for next year. The tone, sustain, power, sensitivity and craftsmanship of all Giussani's instruments are beyond anything I have ever played - and I've played virtually every maker that exists. Another major advantage to Giussani's instruments is that he will custom-build. You can specify size, woods and even tell him the type of sound you want, and he knows what to do to get it. I had used Audio Technica mics on my last 3 CDs long before I had the endorsement contract with them so it was a conscious decision to use their incredible products - and a true joy to be able to land an endorsement contract with them! My CDs with "The Nova Project" ("The Holy Sonnets" and "The Viennese Sketches") used Audio Technica "Artist Elite" series; the AE 6100 and the AE 5100. Naturally I'm using the ATH M40 closed-back headphones which are the studio-standard for serious recording. This combination of mics is giving us a sound that is 100% pure, non-colored, and a frequency response that you absolutely MUST have for classical music. They are the best mics I have ever used - and I've used almost everything on the market. Top it all off with the fact that their office is staffed with some of the most knowledgeable AND friendly people in the business and you'll understand why I'm so thrilled to be working with Audio Technica. Classical guitar and... Marshall amps...???!!! This bears an explanation! For performing concerti with orchestra I, and virtually every classical guitarist, uses a small acoustic amp for just a little sound support, but the story goes further. 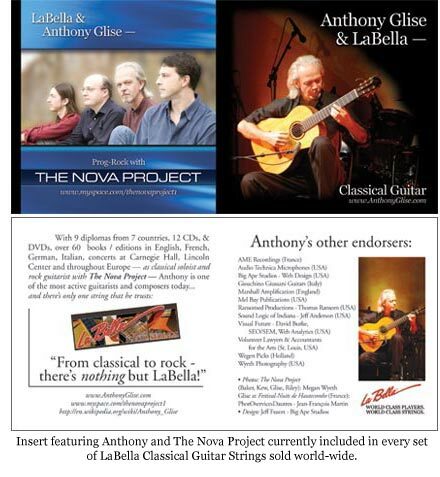 My next 2 CDs (for the Nova Project®) include work (recording and live concerts) with a number of noted jazz, rock and classical musicians. When we did the trial concert tour for The Nova Project® it became evident that I was going to need some amplification for the upcoming European tour. Fortunately, Marshall had just come out with a new AS series of amps that are specifically designed for acoustic players. Brilliant pieces. They are small, incredibly clean and have a host of features as well as built-in phantom power for mics (which work perfectly with the Audio Technica AE5100). I'm currently using the Marshall AS 100, but there is a smaller AS 50 as well. I've rarely seen these in catalogs in the US but they are the perfect solution that we've all been looking for. The AS series of amps are not just another "acoustic" amp. These are specifically designed to give you the pure sound of your instrument and voice. Nothing less. Some of the best guitarists alive swear by Wegen Picks - a list that includes the brilliant Dutch Guitar Legend, Jan Akkerman, Jason Riley (The Nova Project), The Rosenberg Trio, etc. As a classical guitarist I rarely use a pick, but when I do, Wegen is the only brand I’ll use. Each pick is hand made by Michel Wegen of Holland and range from incredibly thin to their “Gypsy Jazz Pick” which is about the thickness of 2 quarters! These larger picks are beveled on both sides on the edge to give a pure, fast release, great tone and each one is notched on both sides to keep them from slipping between your fingers. 1) many of us have occasional difficulty with legal situations - from accounting problems to record-company lawsuits and 2) many of us have finances that vary drastically from "comfortable" one year to "destitute" the next; it's simply the nature of the business. So, what happens if you're in one of those down-times and you have a legal or accounting problem? CALL VLAA ! They are extremely friendly, professional and helpful. They're also used to dealing with artists so they will understand your situation. There is a general application that you need to go through (to establish your situation, financial need, etc. ), then you are assigned a lawyer, accountant, or whatever your need (usually directly in your area) who will walk you through to a solution and it's free. The branches in St. Louis and Kansas City (Missouri) are the one that I have worked with and they are beyond brilliant, but you should check the web for the VLAA in your state. (click here for a PDF of VLAA programs throughout the US).